Légende de la photo : Eretmodus marksmithi Burgess, 2012, spécimen capturé et photographié au PK 105,nationale 3 Burundi. Apparement, Eretmodus sp North serait décrit : Burgess, W.E. 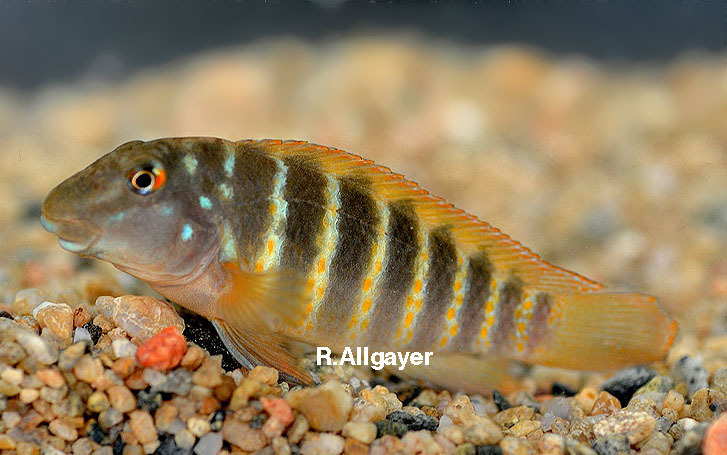 (2012): A New Species of Goby Cichlid of the Genus Eretmodus, E. marksmithi, (Pisces: Cichlidae) from the Northern Part of Lake Tanganyika / Nowy gatunek pielegnicy "babki" z rodzaju Eretmodus, E. marksmithi, (Pisces: Cichlidae) z pólnocnej czesci jeziora Tanganika. Dans la description, notamment parmi les paratypes, il y aurait un "mélange", cependant l'holotype est bien un sp North et unique porte -nom donc E. marksmithi serait bien valide, cependant Eischmeyer n'a pas encore validé. marksmithi, Eretmodus Burgess [W. E.] 2012 [Tanganika Magazyn v. 12; ref. 32290] Northern part of Lake Tanganyika. Awaiting original. •Valid as Eretmodus marksmithi Burgess 2012. Current status: Valid as Eretmodus marksmithi Burgess 2012. Cichlidae: Pseudocrenilabrinae. Distribution: Northern part of Lake Tanganyika. Habitat: freshwater.